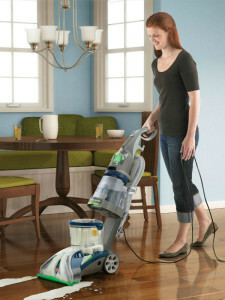 The Hoover Steam Vac Dual V’s versatility makes it usable on carpet. hard-floor, and upholstery. With an overall 3.9 star rating, customers report being satisfied overall with this machine’s performance. This Hoover carpet steam cleaner includes easy-to-empty dual tanks for dirty and clean water, an automatic detergent mixing system, an auto rinse feature, six rotating brushes that feature the Hoover SpinScrub technology, and a SpinScrub powered hand tool. This model also features hard-floor accessories, such as a squeegee, SpinScrub brushes, and soft wheels. It is lightweight at 30 pounds, offering ease of use and portability. The handheld tool makes it easier to clean stairs and upholstery. Cord length is 20 feet, allowing you to reach the far corners of most rooms. The hose on the hand tool can reach 8 feet, making it great for edge cleaning. The price is affordable, listed for sale at numerous places for under $250. The 13 inch cleaning path and the rotating brushes make it quicker and easier to clean your carpet, compared to some other home use steam cleaners. The one gallon tank is sufficient for the average room. 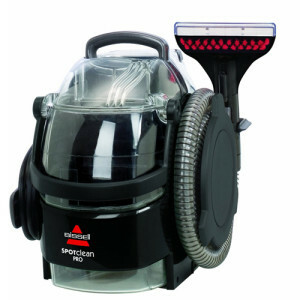 It features 3 speeds, with a powerful 12-amp motor, to get your carpets cleaner with more powerful suction. 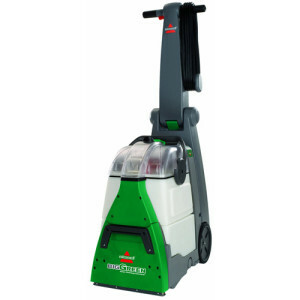 It is capable of heavy usage, including pet hair removal, yet offers maneuverability. 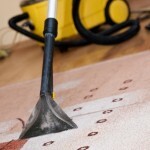 Heavy traffic areas can benefit from the SpinScrub cleaning and lifting, adding more lift to the worn-looking areas. While most users report it cleans better than many rental units, there can be problems with rubber stop valves falling apart eventually or water tanks leaking, if you have the machine for two or three years. This might be expected of all machines in this price range. One reviewer reported that the machine was noisy, but the rotating brushes seem to be the blame, although the larger motor will make it louder. 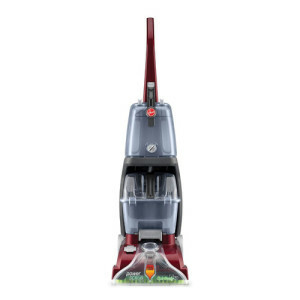 In a user review of the Hoover Dual V series, there are some models that seem to be made with some plastic parts, so it depends on the models and type of usage you plan. 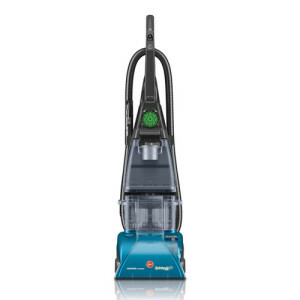 The Hoover steam vac dual V F7412-900 and the F7411-900 weren’t particularly mentioned by the user, but lightweight is a feature for portability. The water temperature is not actually “steam”, but whatever temperature the water is, you put in the machine. There is no water heating mechanism on this model. Some users might require a machine that is heavier-duty, especially those that have many children or excessive pet hair to clean. Clogging can occur with the brushes, in certain instances. For those that are looking for an affordable home steam cleaner for average household use, the Hoover Steam Vac Dual V Widepath seems to be a good model to consider. 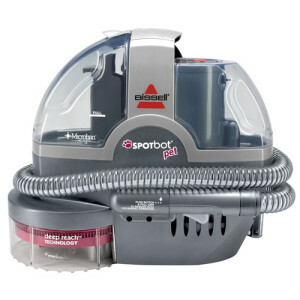 Many users reported it as a great steam cleaner for homes and one that is quite capable. The affordable price and extra features like the dual V suction and Spin Scrub hand tool makes the it an all-purpose cleaning machine to keep your carpet and furniture looking good. You may find checking reviews for the various other Hoover carpet steam cleaners useful if you’re uncertain that this model is right for you.